If you would like to join our Adult league this season, sign up or contact us to find out more information. Players can sign up at any time during the year. Registration is per calendar year (eg. Jan - Dec). Adult soccer is a great way to keep fit. Adult Soccer is played on Saturday mornings on East State Street next to Lowes. The kick-off times run from 8am until 12pm EST. Games last approximately 45-50 minutes. We offer a recreational League 2 where we do not keep standings, and a more competitive Premier League (in the Fall) where scores and standings are kept. Athens has a very active and friendly soccer community, if you are interested in playing soccer please sign up. If you are new to the area or do not have a team, we will get you onto a team. Our organization is dedicated to promoting a positive soccer experience and providing the opportunity to play soccer to everyone who wants to play, regardless of skill or ability. We have players ranging in skill from absolute beginners to former professional players. Soccer is a fantastic way to exercise while having fun. We offer youth programs in Athens that cater for kids aged 3 to 6 on Saturday mornings at 10am. We do not offer a program for kids between the ages of 7 and 12. There are many great soccer programs in the area already for this age group. Recreational soccer for kids ages 7 to 12 please contact the Athens Community Center on East State Street, or the Alexander Soccer Club in Albany. For more competitive travel soccer, please contact Alexander Soccer Club in Albany or Athens Soccer Academy. For kids aged 13 to 15 we offer a program in partnership with GASA during the Spring. We have a special program for kids age 16 and 17. Please contact us using the information below for further information. We offer a Sunday League for Women which is on Sunday afternoons, you can find more information under our Leagues. This league is open to women aged 18+ and is typically played from 5pm on Sunday afternoons. You must be a member of Athens Community Soccer to participate in this League, and the League is managed through this site. 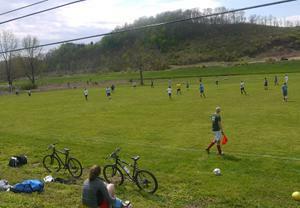 Athens Community Soccer is a volunteer run 501c3 non-profit organization dedicated to improving the soccer experience in Athens County, Ohio for Youth and Adult Players. We offer Saturday morning recreational soccer leagues for Adults (18+) in partnership with the United States Adult Soccer Association (USASA). Players can join at any time during the year. Our philosophy is to give as many people as possible the opportunity to play soccer in our local area. Adult Premier League is our top-flight Saturday morning League, we recommend this League for anyone with prior soccer playing experience and moderate-good level of fitness. 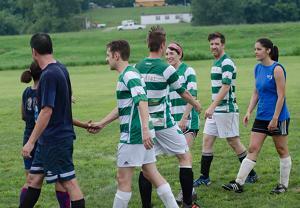 The Athens Premier League maintains standings and is played in a competitive yet friendly manner. This program runs in the Fall only. Adult League 2 is our recreational Saturday morning League, we recommend this League for anyone looking for a fun, friendly and social soccer experience. Games are played at a decent pace with players ranging in age from 16 to over 65. This league has a welcoming and fun mentality, so regardless of your experience, you can get an enjoyable game from this program. Games are played on Sunday afternoons from 5pm, this is a friendly recreational paced pickup style soccer program for Women aged 18 or older. The cost of Adult membership is $42 per calendar year (Jan 1st - Dec 31st), we offer a discounted rate for players registering in the Fall who also wish to register for 2017. Membership enables you to play in as many games as you would like, including Premier League, League 2 and Women's League. There is a season fee of $20 per player which covers referees, equipment and field usage fees. 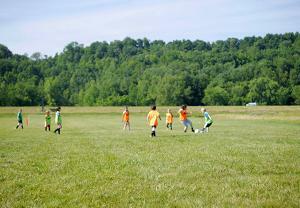 Athens Community Soccer offers a Saturday morning youth program in partnership with SAY Soccer. Our youth program caters to two age groups, kids aged 3 to 6 and kids aged 13 to 15. The program is designed to provide kids with a fun, safe, fair and balanced environment to play soccer. The youth programs are designed to maximize the participation for each kid, giving them a fun experience and helping to build their skills and confidence. This program is coached by experienced soccer players. The program is designed for kids to learn basic skills, build confidence and have a positive fun experience. For many kids this is their first time participating in a team sport and our goal is to provide them with a positive start. The program starts with a quick warm up in a large rectangular area marked with cones, kids can bring their own ball (size 3) or borrow ours for the session. After the warm up, we play a fun game called "The Monsters Game", this teaches the kids ball control, how to shield the ball while having fun. We always play this game first as the kids become familiar with it and it helps to build their confidence knowing how to participate in the first activity. The second game is changed each week, and usually focuses on a skill such as running, dribbling, passing or shooting the ball. We end the session with several small sided games, typically 3v3 or 4v4, making sure each team is fair and balanced as much as possible. This age group kicks off at 10am every Saturday morning starting April 22nd 2017, and running until Saturday May 27th. This program is run in the Spring in partnership with the Greater Athens Soccer Association (GASA). This program places kids into evenly balanced teams, each team has coaches with practices and schedule games. For more information, click here to visit the GASA League Page. The cost of our youth membership is $20 per calendar year (Jan 1st to Dec 31st). This not only covers our Spring and Fall seasons for kids aged 3-6, but also covers outdoor Futsal during the Winter months at the Athens High School turf field and reduces the cost of the GASA program by $10.